Attending the eleventh Küstendorf International Film and Music Festival, held in the snowy mountains of southern Serbia from January 16–21, 2018, was more for me than just taking a four-hour ride from the Belgrade airport to the mountain village of Drvengrad to watch films from around the world. I was especially eager to update my more than thirty-five years of involvement with the cinemas of the former Yugoslavia and to observe the social and political changes that have occurred following the breakup of Yugoslavia, the tragedies of the Bosnian War, and the hardships in its aftermath, since I continued to work with filmmakers of the former Yugoslavia throughout those years. Nobody is happy. Many feel betrayed in the fight for a Greater Serbia. The Bosnian Serbs are not happy, the Croats are not happy, and the Bosnians are certainly not happy. This war may still continue anywhere. Yet, despite such troubling memories then, I was impressed with the wide variety of films and filmmakers from around the world, and especially with the formation that year of a Balkan Film Board with founding members attending the festival from Romania, Bulgaria, Turkey, Greece, Slovenia, and the Former Yugoslav Republic of Macedonia. Such a positive outreach across Balkan borders was celebrated at the FEST, as they called the Belgrade Festival, and this new Film Board led to much cooperation of filmmakers from all these countries sharing works at their own respective festivals. I left Sarajevo after a very full week, both impressed with the festival and deeply moved by the horrors of the war but also by the vibrant rebuilding of the city and its richly textured cultural life. Take the detail, for instance, that the Sarajevo Festival that year screened films in seven locations around the city, and that it included films from Slovenia, Romania, Bulgaria, and other Balkan countries, clearly fulfilling the goals of the Balkan Film Board. Thus, as I attended the Küstendorf Festival fifteen years after the Sarajevo Festival, I was hoping to see if the spirit of sharing contemporary Balkan cinemas has continued to thrive in the world of “post Yugoslav” cinema and culture. My expectations raised an interesting question in my mind as we drove through twisting, snow-covered highways towards Küstendorf: What do the facts of studying film at the Czech Film Academy in Prague, being an award-winning filmmaker at Cannes and many other festivals, being a popular rock composer and musician for decades, being friends with many artists and politicians around the world, from Johnny Depp to Vladimir Putin, being born into a Bosnian Muslim family but becoming a Serbian and Orthodox Christian, being able to enjoy a loving family, and being able to raise funds from the Serbian Ministry of Culture as well as private sources for cultural activities, while also helping to create a national park, have to do with one another? The answer is simple. These are all aspects of the character and career of filmmaker Emir Kusturica, the founder and director of the Küstendorf Film Festival, whom I have known personally for over thirty years. Kusturica is the multi-award- winning Serbian filmmaker from Sarajevo, including two Palme d'Or awards from Cannes for When Father Was Away on Business (1985) and Underground (1995), as well as the Best Director prize for Time of the Gypsies (1988). But his films have not been limited to the former Yugoslavia, as his Johnny Depp film, Arizona Dream (1993), shot in the United States, suggests. Internationally, he has devoted time to a variety of activities including serving as Chairman of the Cannes Film Festival Jury (2005), teaching as a film professor at Columbia University in New York, serving as head juror of the first St. Petersburg International Film Festival (2012), and making documentaries such as Maradona (2007), on Argentine soccer star Diego Maradona, and another on the life of the Uruguayan president José Mujica (2013). Throughout many of those years, Kusturica also handled controversies about his friendship with Vadimir Putin, the political implications of several of his films, particularly Underground (1995), and the complexities of his Bosnian Muslim and Serbian Christian Orthodox identities. Yet, as we arrived at the festival on January 16, Kusturica joyfully welcomed all of us critics and filmmakers from around the world as we stood in the snow-filled Küstendorf Square surrounded by forest-covered mountains. Later, he was always available for anyone who wished to speak with him, or his wife, son, or daughter, all of whom help with the festival, and who are actively involved in filmmaking, including Kusturica’s latest feature, On The Milky Road (2016), that screened at the festival. Emir Kusturica surrounded by reporters. The southern Serbian location of the Küstendorf “cinematic village” is officially known as Drvengrad. The village was originally a set for one of Kusturica’s films, Life Is a Miracle (2004), and then, under Kusturica’s direction, as the founder of the Küstendorf International Film Festival eleven years ago, it became an actual village with three theaters, several restaurants and cafes, a library, and many residential cabin units, with each street named after a filmmaker such as Federico Fellini or well-known writers such as the Nobel Prize-winning Serbian author, Ivo Andic. While other festivals such as the Sundance Film Festival, which is held in the beautiful Utah mountains, but within the town of Park City with a population of over seven thousand, the Küstendorf Festival has no actual town or village other than the festival- related buildings. Attending the festival, then, means you are literally entering a cinematic world! Once I settled in and began reviewing the festival program, I became aware that Kusturica has been able to maintain a strongly international spirit with films from more than a dozen nations, but I was a disappointed that the sense of a coming together of Balkan and former Yugoslav films and filmmakers that the Balkan Film Board, whose role was so instrumental in the aforementioned Belgrade and Sarajevo festivals, was not as much a part of the Küstendorf event as I had hoped. Kusturica himself, for instance, has not returned to visit Sarajevo or Bosnia in more than twenty years, and in terms of filmmakers of the “former Yugoslavia” sharing and coming together, several of these new “countries,” such as Bosnia, were not represented. Indeed, there were few Balkan countries represented, with one exception I particularly appreciated. Bulgarian director Stephan Komandarev was present at the festival with his latest film, Directions (2017), about six taxi drivers in the Bulgarian capital, Sofia. Five drivers are men, one a woman, and one of the men is, yes, an Orthodox priest! The priest taxi driver in Komandarev’s Directions. When asked by a student why he became so interested in the lives of taxi drivers, Komandarev explained that he was fascinated by the “double life” of each driver, and then added an important observation: “Haven’t you noticed how taxi drivers can often be psychotherapists, for the customers often open up all of their life’s problems to the driver!” Of course, this had audience members mentioning how other taxi films have in a way built on this theme, such as Martin Scorsese’s Taxi Driver (1976), and many commented that such a subject is so universal that Komandarev’s Directions would be totally enjoyed and appreciated in any country. When the workshop ended, the dialogue between Komandarev and audience members, mostly students, continued as they simply moved up to the lounge café above the theater to continue their discussion about making films that matter to each of them. Sessions such as this therefore clearly supported the spirit of sharing Balkan-made films within the Balkans, and I only wished that there had been more Balkan countries represented in the festival. I wish to stress another point that made this festival impressively attractive: at least half of the audience was made up of film students, particularly from the Belgrade Film Academy, most of whom had an impressive command of English, which enabled them to learn a lot from each of the screenings and workshops with foreign filmmakers. In this regard, I discovered that Emir Kusturica—who has been a professor of cinema in Belgrade, Paris, New York, and elsewhere—is addressed as “Professor Kusturica” by almost everyone who speaks to him. That experience, including his own film education at the International Film Academy in Prague in the 1970s, which included faculty members such as the novelist Milan Kundera, has clearly made Küstendorf a festival dedicated to “educating” its audiences. Furthermore, the festival’s competition section for student films from around the world this year included twenty-two student films from Serbia, of course, but also China, Poland, the United States, Egypt, Palestine, Mexico, Israel, Russia, and France. The awards were announced on the final evening, with prizes going to a Spanish, Egyptian, Montenegrin, and a Russian film. Kusturica does have strong international connections, which were reflected in the films and filmmakers in attendance, starting with the opening night film, as Swedish award-winning writer/director Ruben Östlund screened and discussed his 2017 Palme d’Or winning film The Square. Anyone who has seen this wildly unpredictable satire would doubtless agree with the Roger Ebert Website critic Barbara Sharres that The Square is “a wicked and sometimes hilarious satire on the world of contemporary art and museums, raising questions concerning personal responsibility and humanity, treating them as comic fodder.” The audience was thoroughly captivated by this 142-minute film, and Östlund led a lively discussion workshop that could easily have gone on for two hours if it hadn’t been time for the music to begin. Poster for Kusturica’s band The No Smoking Orchestra. Yes, beyond the films at Küstendorf, there was also music. The festival is, as its Website and title make clear, the Küstendorf International Film and Music Festival. Each day is filled with screenings, workshops with important filmmakers from around the world, and competition films shown in the evening. The festival’s opening night featured multi-Grammy nominated guitar hero Gary Lucas from New York, who brought audiences out of their seats with standing ovations. Each night at midnight, other talented groups played for hours to crowds that enjoyed the wide variety of music, including Kusturica’s own No Smoking Orchestra, with its Balkan/Latino/gypsy fast-paced beat that has provided the soundtrack to many of his films. Other evenings included Japalkan, a Japanese Balkan band; the Vlatko Stefanovski Trio from Macedonia; Les Barbeaux, a French-Spanish singing punk rock group; and a Serbian rock group, Bajaga I Instruktori. While I did stay up past 1:30 a.m. to enjoy the performance by Kusturica’s No Smoking Orchestra, as a lifetime film festivalgoer I noticed that most of the music lovers who stayed up past 3:00 a.m. each morning, did not appear at morning or early afternoon screenings. Indeed, my vote would have been for a straight-on film festival, with the music being added to some events, but not offered as a complete festival itself. Getting back to the Küstendorf film program, the highlight of the second day was the festival’s central guest, Italy’s Paolo Sorrentino, who screened the first episode of his Emmy nominated television series (HBO/Canal Plus) The Young Pope (see review in Cineaste, Fall 2017). Jude Law’s performance as a quirky young American Archbishop unexpectedly elected as the new Pope had a full-house audience at Küstendorf in stitches. This screening served as the introduction to the festival’s focus on Sorrentino, who was given a “Retrospective of Greatness” with screenings of his films The Consequences of Love (2004), The Family Friend (2006), and Il Divo (2008). Sorrentino’s presence was an excellent way of emphasizing the topic that concerns filmmakers and audiences throughout the world today: what is the future of cinema as global digital media and television have revealed so many alternative options for production and distribution beyond films being shown in the diminishing number of cinemas in the world? The Q&A session that followed had Sorrentino answering the question, “How do you feel moving from feature films to television series,” with an enthusiastic “I love it!” He made it very clear that our new media environment has made it easier for a “foreigner” to get her or his work seen in other countries, including the United States, and that the multi-episode series format of so many shows these days provides filmmakers/screenwriters a wonderful variety of “stories” to develop beyond what one can do in a single feature film. While international filmmakers and screenwriters were celebrated at the Küstendorf Festival, a leading Serbian actor, Aleksander Bercek, whose career includes more than one hundred film roles, was given a spotlight that covered much of the best of Yugoslav cinema of the past. I was particularly happy, for example, to see again after so many years his performances in Rajko Grlic’s Bravo Maestro (1978) and Slobodan Sijan’s Who Is Singing Over There? (1980). Who Is Singing Over There? Yes, what was “Yugoslavia” no longer exists, as it has broken up into a handful of separate nations. But this joyful recognition of Bercek’s fine career in Grlic’s Croatian-centered story in Zagreb of Bravo Maestro and a carnivalesque mixture of gypsy and Serbian culture on the edge of World War II in Who Is Singing Over There?, was particularly appreciated, especially by the young Serbian students I spoke with who had not seen these films. Before announcing the final award—The Golden Egg—winner, however, I wish to mention how impressed I was with the international jury, several of whose members I had the pleasure of getting to know over many meals, conversations, and exchanges before and after films. Rosa Attab, jury president, is a French native with credits including Ken Loach’s I, Daniel Blake (2016); Serge Regourd is the author of more than fifteen books on French cinema and cultural issues; Isvan Borbas, Hungarian born, is an award-winning cinematographer in Sweden who has done a lot of work with Roy Andersson. Vlastimir Sudar is the jury member I got to know best on our four-and-a-half-hour ride from the Belgrade airport to Küstendorf on the first day of the festival. In many ways, in fact, I would say that Vlastimir characterizes the true spirit of the Küstendorf Festival. Born in Sarajevo, he has lived most of his life in England, especially London, and completed his PhD in Balkan Cinema at St. Andrews University, turning his thesis into a recently published book in English, A Portrait of the Artist as a Political Dissident: The Life and Work of Aleksandar Petrovic. As we shared the long ride to Drvengrad, Sudar made it clear as a film professor from the former Yugoslavia specializing in Balkan cinemas that, with the collapse of Yugoslavia, there is an ongoing need to share with students the fine cinemas of the past, ranging from the “Black Wave” films of Dusan Makavejev in the 1960s, such as Innocence Unprotected (1968), as well as the work of award-winning Yugoslav filmmakers who graduated from the Prague Film School, including Kusturica, Rajko Grlic, and Srdjan Karanovic, among others. Sudar agreed that Kusturica’s experiences, especially with the Cannes Festival that has “internship” programs for students from around the world, has helped shape his efforts to have film students attend the Küstendorf Festival. The conclusion of the festival saw students, filmmakers, and guests continue their dialogues with one another as they prepared to head “home,” wherever that was to be the following morning, on a large double-decker bus that transported more than a hundred fifty festival attendees for the four-hour drive to Belgrade. That long trip helped me contemplate Kusturica’s decision not only to create this international film and music festival in such an isolated and, yes, beautiful location, but also his decision to live there as well, stating in many interviews that he is “fed up” with cities, having lived so many years in Paris, Belgrade, and elsewhere. Thus, my walks through the snowy paths between theaters did bring back to me a feeling of the Sixties that Kusturica has established here for others who are likewise “fed up” with taking on cinema and life in large cities. While I had been hoping for Küstendorf to offer a wider participation of Balkan and former Yugoslav filmmakers and films, my many discussions with Serbian film students and filmmakers left me with a feeling that, despite economic and political hardships, many of them are eager to continue to tell stories on film, media, the Internet, and other media that can touch us all. 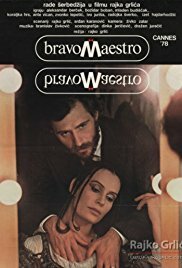 One student, for instance, who had seen the popular 1983 film directed by Srdjan Karanovic that I had co-written, Something In Between, suggested a remake would capture the spirit of Serbia today. Why? She mentioned that when foreigners ask her to try to explain the situation in Serbia today as a post-communist, post-Yugoslav nation, not yet a member of the European Union, she refers to a line in Something In Between when an American woman in Belgrade in 1983 (Caris Corfman) tries to figure out how Yugoslavia works as a communist country with largely capitalist realities. “Very complicated,” says the Belgrade character (Miki Manoljovic) to the American, unable to offer any simple explanation. A remake of the film, the student suggested with a smile, would convey the reality that Serbia and the former Yugoslavia are still “very complicated” today. As the bus pulled into Belgrade, I smiled, too, and agreed that the Küstendorf Festival had helped me to realize that thirty-five years after I co-wrote that script, “very complicated” was still an accurate phrase! The bus for Belgrade loading up. For further information on the Küstendorf International Film and Music Festival, visit here. Andrew Horton is the Jeanne H Smith Professor of Film and Video Studies Emeritus of the University of Oklahoma, an award-winning screenwriter, and the author of thirty books on film, screenwriting, and cultural studies including Writing the Character Centered Screenplay (University of California Press, second edition, 2000), The Films of Theo Angelopoulos (Princeton University Press, second edition, 1999), and Laughing Out Loud: Writing the Comedy Centered Screenplay (University of California Press, 1999).